Whether they're appearing in movies, music videos, or on the front covers of magazines, celebrities are rarely seen without a face full of makeup and/or a misleading amount of Photoshop. But as you can see from this revealing list compiled by Bored Panda, sometimes celebrities get tired of living up to expectations. Sometimes they just want to be normal people for a day, and what better way to act normal than by looking as tired and ungroomed as the mortal masses! From Lady Gaga and Sofia Vergara to Jennifer Lopez and Anne Hathaway, the pictures below contain a bunch of your favorite famous people like you've never seen them before. 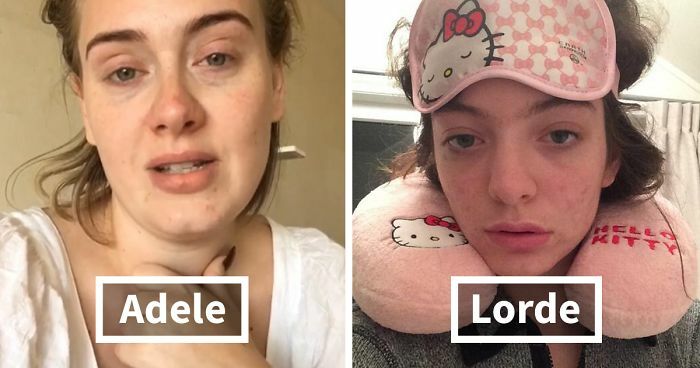 Who looks the best without makeup? Let us know in the comments below. Too bad I can't upvote this picture more than once . No need for make up! The book she's holding is a must read for women. Around 800 pages, but once you start, you cannot stop. And yes Miss Watson is gorgeous. On of m'y favorite british actes. Pure class. She definitely doesn't need make up! And Portia. She should be named in the title, too. She is almost the same. Wow ! ! She seems pretty exhausted. Her eyes say it. Take a long break girl. I love her, but I feel like she doesn't wear all that much makeup most of the time? If they did put her name I would not of recognized her. She almost looks the same with and without makeup! She definitely has some strong natural beauty game. "Oh nice, you brought me some boo... COFFEE,! Such a talented actress! Love her. And she looks awesome with normal makeup, green n blue alien makeup, and sans makeup! Beautiful but I have to disagree with the pineapple thing. She looks pretty happy for someone who's had 40% of their eyebrows recently stolen. I loved her! She's awesome! Bjork is awesome no matter how she looks. Amanda is cute, but what I really Love is the skeins of beautiful yarn!! i eat packets of seaweed like there's no tomorrow! mmm. Her smile can light up the world. JLo is like a chameleon, her look changes so easily!! After nap look: "Where am I? What year is it? Have I been sleeping for last 10 years?" Awww, ¡su chavita tmb está hermosa! She looks better without all that fake makeup. She is so very pretty, and looks wonderful without any makeup on. Julianne is a very pretty young woman!! Didn't realize how beautiful she is until just now. Her expression is hilarious. Love this. The make up is very visible here. gorgeous !! esp he freckles, which are cute. Is that a Pony made just after her? How does she do it? What kind of sorcery is that? The most natural of all beauties. Love her.